CELLULAR DIVERSITY: Cells of different tissues and organisms exhibit an array of dramatically different shapes and sizes. Here, clockwise from top left: retinal rods and cones, stacked red blood cells, Purkinje cells in the cerebellum, sensory hair cells in ear, the unicellular protist Stentor coeruleus, and the corneal endothelium. When we first learn about cells in grade school, we’re told to imagine them as “blobs.” And indeed, some cells really are blob-shaped, perhaps most famously the amoebas that ooze across the bottom of a pond engulfing smaller organisms. Most of the tissue culture cells that serve as workhorses for cell biology research, such as HeLa cells, are also pretty bloblike. But if we stop looking at cells grown in a dish and start examining those found inside the human body, we are immediately struck by the wide range of beautiful and intricate shapes. Cell interiors are also full of three-dimensional geometric complexity. Cells aren’t just watery bags of enzymes, but rather are compartmentalized into a large number of organelles, each of which carries out different biochemical pathways that together determine a particular cell’s physiology. These organelles divide up cells much as rooms do houses, with the remarkable feature that their size, shape, and number are all dynamically variable depending on the needs of the cell. For example, the endoplasmic reticulum, a network of membrane tubes and sacs specialized for processing secreted proteins, becomes massively enlarged in cells of the pancreas that specialize in secretion. Examining cells found inside the human body, we are immediately struck by the wide range of beautiful and intricate shapes. Another factor influencing cells’ geometry is their building materials. Cells are constructed of squishy materials such as lipid membranes and proteins, both of which can undergo drastic shape changes as they interact with other molecules in the cell. These building materials can move rapidly from one place to another, and their levels and distribution in the cell generally result from a balance of ongoing assembly and disassembly. Biologists often refer to the genome as the internal blueprint of a cell or organism, but it is not a blueprint in the conventional sense: it does not specify the location of each part. Rather, the genome can only specify what parts to make and when to make them, but not where they go or how they fit together. So what dictates a cell’s geometric shape? Despite decades of research since the internal structures of the cell were first visualized by electron microscopy, we still know next to nothing about how its molecular components give rise to a complex three-dimensional cell. As-yet-unidentified mechanisms are needed for the cell to assume its final form. And because structure and function are so intimately linked in biology, unveiling those mechanisms is an ongoing goal of cell biologists seeking to understand not just how cells look, but how they work. Perhaps the most fundamental aspect of cellular geometry is size. A key feature of any cell, for example, is organelle size, which varies greatly across cell type and function. Such need-based differences in organelle size suggest that cells have regulatory pathways that adjust organelle size as necessary for a particular cell, but in most cases we don’t know what these pathways are. One outstanding question is whether or not such control systems need to be able to measure organelle size in order to make adjustments. 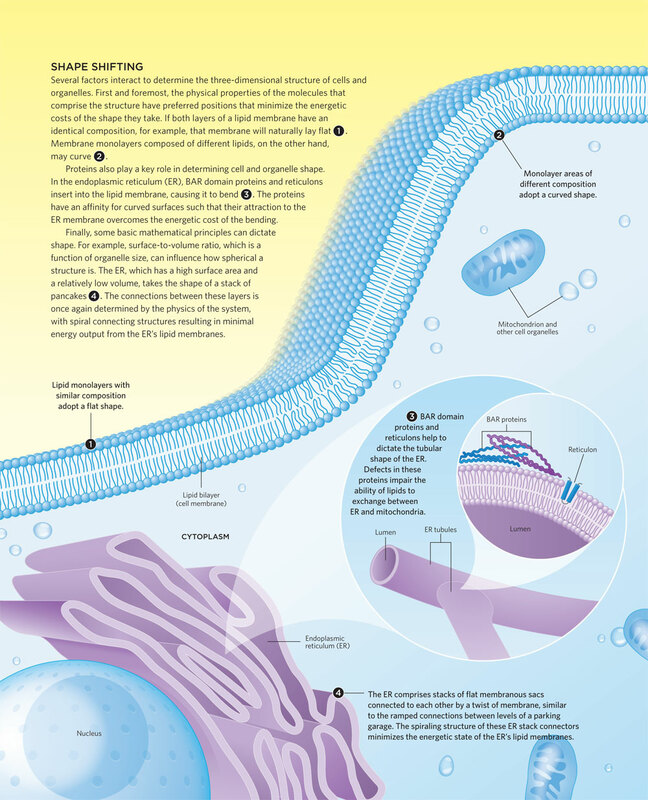 In the case of the endoplasmic reticulum (ER), where proteins destined for secretion are folded into their final shapes, inhibition of protein folding when the organelle’s capacity is exceeded triggers a gene expression program that drives the production of more ER membrane.1 Such a need-based feedback control system ensures that a cell makes ER of just the right size. SHAPE SHIFTING: Several factors interact to determine the three-dimensional structure of cells and organelles. In addition to the importance of proteins in sculpting cellular structures, the physical properties of the structures themselves cannot be discounted. Membrane-enclosed organelles get much of their shape from the basic properties of membranes. A lipid bilayer in which the two layers are identical will be most stable as a flat sheet, but if the lipid composition of each layer is different, then the membrane will have an intrinsic curvature. (See illustration.) In membranes containing mixtures of lipids with different intrinsic curvatures, the lipids tend to separate into distinct domains with their own favored configurations, thus producing complex nonspherical shapes.4 Such lipid-based mechanisms have been proposed to underlie the curvature of bacterial cell poles, which differ from the shape of the rest of the cell.5 Membrane tension and elasticity also affect cell shape by determining how much bending or stretching results from localized forces applied to a membrane, such as those generated by the cytoskeletal filaments that move and flex the cell. In these examples, shape is determined in part by the physical parameters of the components that make up the organelle: if the chemical composition were to change, the shape would be altered. In other cases, shape arises from mathematical necessity. Perhaps the simplest case is the influence of the surface area-to-volume ratio. In a spherical organelle, the surface area-to-volume ratio is a function of organelle size, and no matter what genes a cell might express, it can’t vary the surface area and volume independently without changing the shape or the surface area-to-volume ratio. Starting with a sphere of fixed volume, as the surface area is increased, the organelle becomes less and less spherical and starts to resemble a pancake or sac. Organelles also have to fit together inside the cell, and it is interesting to consider how much of the 3-D structure of a given organelle might be driven by the geometry of organelles packed near it. For example, the nucleus often has a dimple that appears to be caused by the centrosome pressing into it. In this case, the depression itself might have no functional consequences at all, but arises simply as a side effect of packing organelles together. In other cases, organelles appear to work together to sculpt one another, such as when the tubules of the ER help drive fission of mitochondria.7 (See “Give Me a Hug,” The Scientist, February 2012.) Clearly, understanding cellular geometry will require a systems-level approach to determine how the separate behaviors of multiple parts give rise to the function of the entire system. While researchers continue to puzzle over the material properties that dictate organelle shape, there is the additional question of how that shape influences function. As described above, shape may coincidentally arise simply from the physics of the system, with no relation to organelle function. But often, specialized proteins have evolved that affect organelle shape, and organelle size and shape can be altered in coordination with specialization in cell function, suggesting that organelle geometry can indeed be functionally important. For instance, organelle geometry is often perturbed in cancer: most tumor cells show numerous alterations in organelle size and shape, such as the presence of huge vacuoles full of mucus or fragmented nucleoli. It is these alterations that allow cytopathologists to diagnose cancer by looking at cells under the microscope, and although the molecular reasons for these changes are almost entirely unknown, the fact that they occur at all raises the possibility that these changes are part of the development of a malignant cell phenotype. But so far, the evidence is purely correlative. What the field needs most right now is a way to directly test whether changes in organelle geometry can play a causal role in cell behavior. One case in which organelle shape has been shown to play a functional role is in the exchange of lipids between the endoplasmic reticulum and the mitochondrion. In 2012, Christiane Voss of the National Institute of Diabetes and Digestive and Kidney Diseases and colleagues found that defects in the reticulon proteins that shape the tubules of the ER can disrupt connections between the organelles and impair the ability of lipids to transfer from the ER to the mitochondria, a process vital for the synthesis of mitochondrial membrane.8 As our knowledge of the mechanisms that determine geometry of other organelles increases, it should be possible to engineer systematic changes in the geometry of each organelle to probe the consequences for cell behavior and physiology. Understanding cellular geometry will require a systems-level approach to determine how the separate behaviors of multiple parts give rise to the function of the entire system. In general, we can imagine membrane-bound organelles to be like reaction vessels in a chemical factory, where the volume determines the quantity of biochemical reactants each organelle can hold, while the surface area determines the rate of exchange of reactants and products between the cytoplasm and the organelle interior. As with any chemical process, the exchange rate and volume can affect the concentrations of intermediates that accumulate, which in turn can dramatically alter the rate and even the outcome of the reactions that take place within. If an organelle’s size and shape do indeed affect the function of its biochemical pathways, it raises the interesting possibility that we could retune cell physiology by manipulating organelle geometry. For instance, if a tumor cell has an enlarged nucleus, perhaps we could make the cell less malignant if we could drive its nucleus back to a normal size. Currently, however, we do not know enough about the molecules that regulate organelle geometry to even begin testing such a strategy. GIANT CILIATE: Stentor coeruleus, a unicellular protist measuring up to 2 millimeters long and covered in complex patterns of cilia, could serve as an interesting model for understanding the development of cell geometry.COURTESY OF MARK SLABODNICKWhile much about cell geometry remains a mystery, researchers are starting to identify molecules that regulate specific geometrical features, such as length, volume, or curvature, of individual cellular components. But even if we understand how the geometries of intracellular organelles or various types of cellular protrusions are determined, we will still be faced with the question of overall cell shape and internal structure. One specific aspect under investigation is cell polarity. In many cells, it is possible to define one or more axes of polarization, which serve as references to specify the position of intracellular structures. For example, in epithelial sheets, cells resemble hexagonal columns, with the basal end of the cells attached to the basement membrane and cilia sprouting from the opposite, apical end. This polarized shape is critical for organization of tissues based on epithelial sheets, such as the tubes found in the lung or kidney. Similarly, migrating cells, such as white blood cells, develop a clear anterior-posterior polarization axis in response to a chemoattractant gradient, with a branched actin network assembly at the anterior end to drive forward motion. The cell polarity axes are conceptually similar to the body axes of a developing embryo, and indeed, cells face many of the same developmental challenges as embryos. Just as in embryos, different structures must form at defined relative positions, and this requires long-range coordination of morphogenetic activities. In embryos, this coordination is accomplished in part through the action of diffusible morphogen molecules, but we know far less about such morphogens that underlie the development of patterning in single cells, if they even operate at this level. Free-living unicellular organisms provide an excellent platform for studying the development of overall cell shape. They tend to have highly reproducible shapes with well-defined geometrical forms, and because they often grow in isolation from other cells in nature, the cells themselves contain all the information necessary for generating these shapes. Yeast has long served as a model system for studying cell shape, and the power of classical yeast genetics and systematic knockout libraries has been productively applied to the problem of geometry. But since all yeast cells are more or less egg-shaped, the range of shapes that can be studied in such systems is limited. Ciliated protists provide a unique opportunity for understanding the development of cell shape. The surface of these unicellular organisms is covered with orderly rows of cilia arranged in complex patterns that vary only slightly from one cell to the next. Ciliates, at least visually, appear much more like man-made machines than do typical blob-like mammalian culture cells. One of the most intriguing features of ciliate patterning is that it is self-propagating. If a region of the cell surface is excised from a ciliate, rotated so that the cilia rows face in the other direction, and reimplanted, the progeny of that cell will inherit the rotated ciliary rows. Interestingly, careful experiments ruled out the possibility that this inheritance was mediated by the cell’s genome; rather, it appears to be dictated by the organelles.10 The ability of such structures to direct their own reproduction during cell division creates a whole new level of complexity in how cell geometry is determined, and we currently have almost no understanding, at a molecular level, of how this structural inheritance occurs. The giant ciliated protist Stentor coeruleus, which can be more than 1 millimeter long, provides an even more extreme case of pattern formation in ciliates. (See photograph above.) These unicellular organisms have a highly complex pattern of cilia on their surfaces, and are remarkable not only for their size and internal complexity, but also for their ability to regenerate. If any part of Stentor is surgically removed, that specific part will regenerate in a few hours. The mechanism by which such a cell can sense the loss of one part of itself and direct that one part to regenerate is a complete mystery. Wallace F. Marshall is an associate professor of biochemistry and biophysics at the University of California, San Francisco. Originally trained as an electrical engineer, he became interested in cell biology out of a desire to understand how cells can solve complicated engineering problems, such as determining the size and shape of their sub-structures. J. S. Cox et al., “The unfolded protein response coordinates the production of endoplasmic reticulum protein and endoplasmic reticulum membrane,” Mol Biol Cell, 8:1805-14, 1997. W.F. Marshall et al., “Flagellar length control system: testing a simple model based on intraflagellar transport and turnover,” Mol Biol Cell, 16:270-78, 2005. M. Simunovic et al., “Protein-mediated transformation of lipid vesicles into tubular networks,” Biophys J, 105:711-19, 2013. T. Baumgart et al., “Imaging coexisting fluid domains in biomembrane models coupling curvature and line tension,” Nature, 425:821-24, 2003. K.C. Huang et al., “A curvature-mediated mechanism for localization of lipids to bacterial poles,” PLOS Comp Biol, 2:e151, 2006. M. Terasaki et al., “Stacked endoplasmic reticulum sheets are connected by helicoidal membrane motifs,” Cell, 154:285-96, 2013. J.R. Friedman et al., “ER tubules mark sites of mitochondrial division,” Science, 334:358-62, 2011. C. Voss et al., “ER-shaping proteins facilitate lipid exchange between the ER and mitochondria in S. cerevisiae,” J Cell Sci, 125:4791-99, 2012. K. Keren et al., “Mechanism of shape determination in motile cells,” Nature, 453:475-80, 2008. J. Beisson, T.M. Sonneborn, “Cytoplasmic inheritance of the organization of the cell cortex in Paramecium aurelia,” PNAS, 53:275-82, 1965. Photo credits from intro. Clockwise from top left: retinal rods and cones, Steve Gschmeissner / Science Source; stacked red blood cells, Thomas Deerinck, NCMIR / Science Source; Purkinje cells in the cerebellum, Thomas Deerinck, NCMIR / Science Source; sensory hair cells in ear, Susumu Nishinaga / Science Source; Stentor coeruleus, courtesy of Wallace Marshall; corneal endothelium, Ralph C. Eagle, Jr. / Science Source.